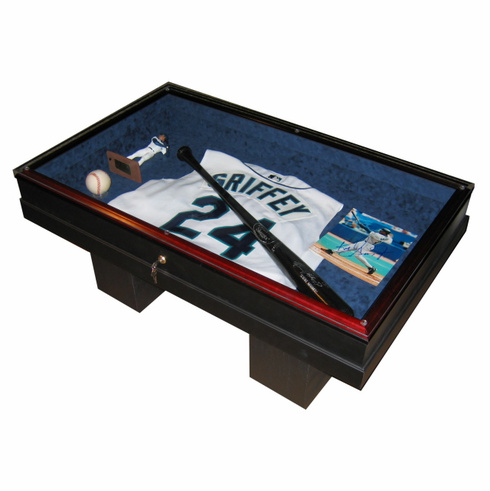 Premier Baseball Display Case - Home Plate Heroes Shadowbox Coffee Table with Beveled Glass Top proudly handcrafted in the USA. Small ($1,100) measures appx. 26" Wide x 42" Long x 18" Tall and holds up to 66 baseballs or 6 baseball bats! Large ($1,420) measures appx. 35" Wide x 43" Long x 18" Tall and holds up to 99 baseballs or 9 baseball bats! These shadowbox cases can protect and proudly display all baseballs, all bats, or any assortment of your collection! This table has an easy opening door with a lock to keep your collection safe. The baseballs sit on top of individual ball holders. Let us know how many of these you would like with your order. The 1/4" thick beveled table top glass lays on top of the Coffee Table with rubber spacers to hold the beveled glass off the door of the table to ensure no scratching to the wood door. Can be easily removed for cleaning and access to the table door. By utilizing this double glass system (UV filtered conservation glass in the door of the table and detachable beveled table top glass on top) you don't have to worry about spilling liquids on the table as the second layer of glass in the door of the table protects the memorabilia inside. Shadowbox area is almost 4" deep. Baseballs, bats, and collectibles pictured are not included.